Spice up your wardrobe with these four fabulous spring pieces! Bright Blazer: This is a wonderful way to perk up a pair of dark jeans or wear over a tunic and leggings. Spring is all about layering while Mother Nature tries to figure out what she wants to be: warm, rainy, cool, or freezing. It’s easy to transform to a work-appropriate look into a date night outfit. Infinity Scarf: These were a new trend this fall and winter, and there’s no reason they can’t transition into early spring where the mornings start cool and the afternoons warm up. They are super comfy, look adorable and take away that early spring chill with ease, especially over a maxi dress. Long Pleated Skirt: Not only are these pieces soft and whimsical, they’re as comfy as your favorite pair of yoga pants. Pair in warmer weather with a fun tank, and in cooler weather with a cute button-up or loose top. They’re great for the office-to-dinner look, just throw a blazer on over your shoulders to polish the look. Maxi Dress: Spring break is approaching quickly. An easy, flowing and flattering maxi dress in a black or trendy stripe is perfect for the spring –to-summer transition. 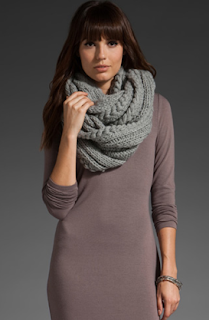 This is another piece great for layering with a blazer, infinity scarf, or simple cardigan.